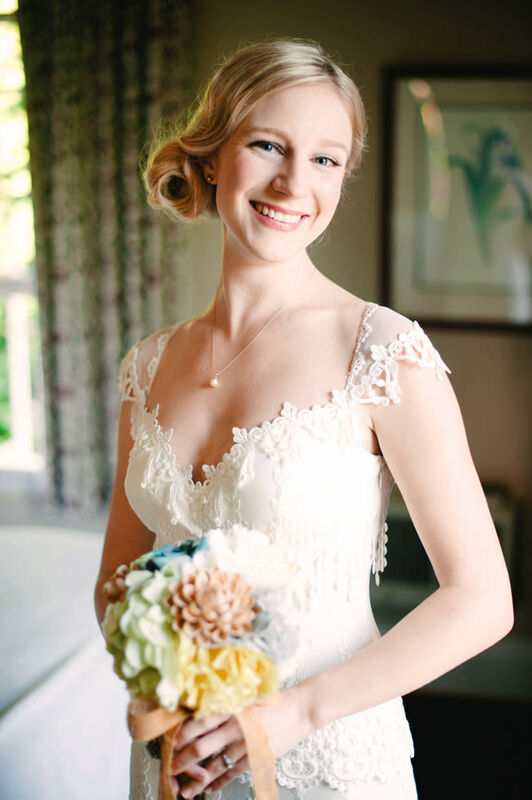 Sellwood bride Tara Gallagher knew Claire Pettibone’s Kristene gown from AniA Collection was “the one” the moment she put it on. 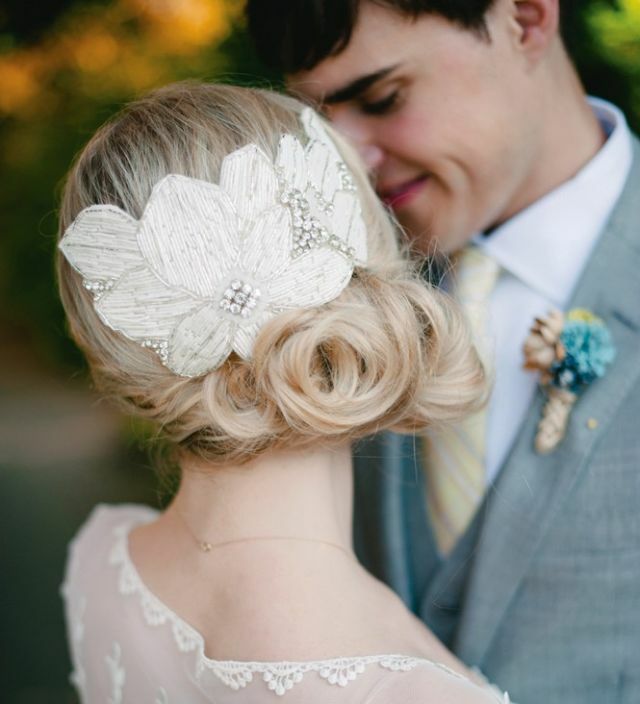 But it was meaningful accessories, like her grandmother’s pearl necklace, her fiancé’s gift of earrings from Gilt, and a custom hair accessory by close friend Austie Eckley, that made her day. “I wanted a non-veil headpiece that would complement my gown’s gorgeous lace back,” says Gallagher, who wed Mason Brock in a vintage-meets-recycled-chic (that bouquet she made is paper and pistachio shells!) celebration at McMenamins Edgefield last July. Lock Star: Everything that goes up must come down. To dismantle your ’do, Gillespie advises loosening hair with your fingers, spraying with detangler, and gently going at it with a wide-toothed comb. Shampoo and deep-condition if you can stay awake. To accommodate the hand-beaded adornment, Amy Gillespie of Flaunt Artistry crafted a low, flowing updo. After prepping with Bumble & Bumble’s Tonic Lotion and Thickening Hairspray, followed by a round-brush blowout, Gillespie curled Gallagher’s mane, sprayed volumizing dry shampoo on the roots, and teased the crown for height. Working left to center, she made a twist; center to right she added a horizontal French roll, curling and pinning the ends over the roll. She finished by sweeping the bangs into a soft wave, spritzed it all with flexible-hold hairspray, and pinned on the headpiece through loops on its felt back. Gallagher’s goal: the clean, bright, bridal version of her minimal-makeup self. Gillespie began with green Koh Gen Do color base to prime the skin and neutralize redness, followed by pearl white to blur pores. Next she used Temptu airbrush foundation, her go-to for brides: “Nothing is as flawless and long-wearing.” She set the foundation with powder and defined the cheeks with blue-pink blush and a glowy highlighter. For the eyes she used shadow primer, Urban Decay’s beige-tone “naked palette” shadows, black waterproof cream liner and mascara, and taupe brow powder. Nars’s shimmery pink Angelika lip gloss atop a dusty rose base made the sweet smile. Tress Prep 101: Nord adores Aveda products: “Apply Volumizing Tonic to dry hair for height and Confixor Liquid Gel for shiny definition, and then blow-dry in the direction of the planned style.” Follow with Air Control hair spray for workable-hold, and backcomb at the roots. “I’m terrible with hair, so even though we were on a budget this was an area I knew we’d need to splurge on for help!” says Cedar Hills bride Sarah Wells, who wed Joe Baker August 3, 2013, during a vacation-like weekend extravaganza of eating, imbibing, dancing, laughing, and lawn games at House on Metolius in Camp Sherman. 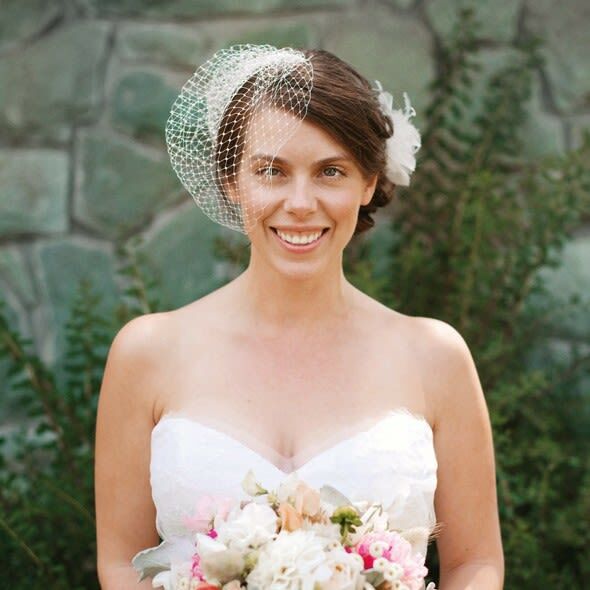 She worked with Makenzie Nord of Zante Salon & Spa to create an effortless-feeling updo that would showcase the Gatsbyesque birdcage veil and feather accessories she something-borrowed from a dear friend. Starting with prepped hair, Nord created curls which she pinned, let cool, shook out, and brushed. Next she teased the crown for a little height, separated two sections behind the ears to do last, gathered the rest of the hair into a low ponytail, and pinned the curls at random to form a “messy-pretty” (Wells’s term) bun. The front sections were loosely swept back and pinned into the bun to complete the look. Bobby pins through the netting secured the veil and created tucks. “Sarah has so much natural beauty with a flawless skin tone,” says Celadon Skin & Nail Care’s Jill Ellison, who went with a luminous, dewy profile. After a light dusting of mineral foundation, Ellison made Wells’s cheekbones pop with Susan Posnick ColorMe in Lilly, a natural flush hue inspired by Natalie Portman. She then used shimmery beige MAC shadow all over the lid, Susan Posnick’s Smokey Topaz liner to create smokiness, and #2 MAC faux lashes for a fluttery fringe. Susan Posnick’s balm-like ColorEssential lipstick in NYC gave Wells her berry-tinted grin. Photograph by the Weaver House .